All Division 4 members are welcome to participate in the Modular Group. Adam Woodie, of North Ridgeville, had a chance to show off the elaborate model train scenery he created for the train show in Avon Lake. AVON LAKE, Ohio -- Quiet summer evenings of times past, interrupted only by children's laughter and the sound of a train whistle in the distance, still feature strongly in the long-ago memories of many people. The Avon Lake Public Library brought back those sounds on April 7 with a train show presented by the 75-year-old National Model Railroad Association (NMRA), Mid-Central Region Division 4. Locally, the association serves the counties of Lorain, Cuyahoga, Medina, Erie and Huron. Scott Benson of Medina, coordinator of the Modular Layout Group, oversaw the show. Division 4 has 200 members, and there are 25 in the layout group. 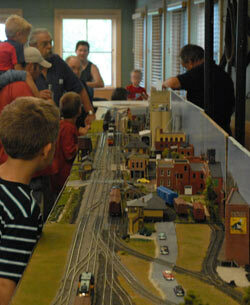 Scott Benson of Medina coordinated the model train show at the Avon Lake Public Library. Benson reflected on the sentiment that continues to fascinate and causes increasing numbers of people to become interested in model trains. "It's about times gone by," he said, "what they were in the past, especially the passenger trains." Benson has keen memories of trains, because he grew up in Chicago and regularly rode trains into the city. "But I became involved in model railroading only about 10 years ago," he said. Five trains were set up for the show, all backed with detailed scenery -- an area that some model railroaders specialize in. Others specialize in making miniature cars look as accurate as possible -- even sometimes including graffiti. Jacob Dew, 14, of Avon Lake, comes by his interest in trains naturally. He built scenery for the show featuring his memory of a place in his hometown of Fredericksburg, Va., where he used to go to watch the local trains pass by. Benson said he has at least a dozen locomotives and about 100 rail cars in his own collection. His layout at home takes up most of the 30-foot-by-30-foot size of the room. He admits it can be a rather expensive hobby. "But now I have the free time, as well as the disposables," he said. His wife, Pam, supports his interest in model railroading, but Benson said the hobby still seems to attract more males than females. When asked what is the best way to get involved in model railroading, Benson noted a "MODEL TRAINing DAY" coming up on Nov. 4. It will be held from 11 a.m. to 4 p.m. at the Black River Landing & Transportation Center in Lorain. The show is free, and for both kids and adults of all skill levels. Hot topics in model railroading today that will be discussed, Benson said, are technology-oriented issues, such as model railroad electronics and digital command and control (DCC) vs. analog (direct current). Other topics will include deciding on the right scale model and building scenery. Show attendees will also be able to build a model kit to take home. The NMRA has more than 150 divisions across the United States and in Canada, Australia, New Zealand and Great Britain. For more information, text DIV4 to 22828 to join the Division 4 express mailing list, or call 423-892-2846 or visit www.nmra.org. Members of the National Model Railroad Associationcame to the Avon Lake Public Library on April 8 to share in their passion for model trains. 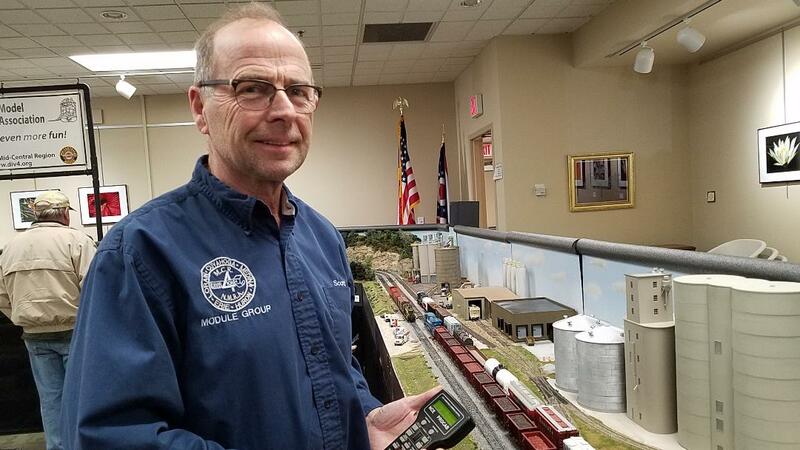 The organization representing Mid-Central Region, Division 4 brings together model train enthusiasts from Cuyahoga, Lorain, Erie Medina and Huron counties. Division 4 Module Coordinator Scott Benson said along with doing public displays they provide a social network so that people can get together and share information about the hobby and also setting standards for how model railroad equipment is designed. “Great, it’s been really busy. Yesterday (April) we had a great crowd and today everybody’s here. It’s been really good. We’ve been coming to this library now for four to five years and every year we get a really good turnout. They do a really good job of promoting it,” Benson said. This year’s display featured 14 four-foot model train models in a 40 x 25 foot display with unique creations including depictions of real locations in Ohio along with fictional places devised from imagination. “Some people model real scenes and other people just do fictional scenes so it’s up to them. We don’t have a standard that we try to replicate so we really get a little bit of everything. “People do different things based on what their interests are,” Benson added. A grain elevator display based on Monroeville, Ohio was complemented by the fictional creations of Carolton, “Black River” in an ode to Lorain County and a crossing depicting Erie County known as Sterling. John Muzilla of Avon Lake brought his young son Samuel Muzilla to take a peek at the creations. “Samuel wanted to see it. Yeah it’s a lot of fun. We were here at Discovery Works yesterday and then we looked up and saw the train exhibit so we wanted to come look at it but we had some errands to run so we came back today,” Muzilla said.